This story was not written by a robot, but in the future it might be. You might be thinking: Of course it wasn't written by a robot. That would be crazy. But believe it or not, sophisticated computer algorithms are already writing thousands of news stories a year. You've probably read at least one already. Advanced software programs scrape sources like corporate earnings reports and baseball box scores and then transform the data into sentences that humans can understand. The finished product won't win the famed Pulitzer Prize, but it does a decent job of telling the basic story. Just ask The Associated Press, one of the world's largest news-gathering organizations. The AP only adopted automation last July, but it already pumps out nearly 5,000 automated stories a quarter. It even invested in Automated Insights, the company that uses Big Data to create this content. "We're at the very early stages of this. It's been highly successful for us," Lou Ferrara, the AP's vice president for sports, entertainment and business news, told CNNMoney. 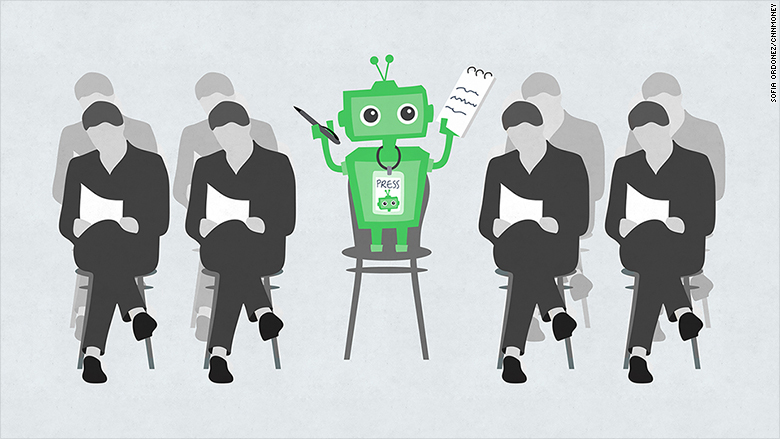 Are human jobs threatened? The rise of the robot reporter has caused some understandable anxiety among human scribes jaded by years of technology-fueled job losses. Not only is the "robot journalist" much cheaper than a human reporter, it doesn't get distracted by Twitter or whine to an editor about a headline. However, Ferrara insists that no AP jobs have been lost because of the automated technology. Robots don't threaten human journalist jobs because automated content is typically used to expand coverage, not replace existing coverage. "We'll take care of the stuff that takes repetitive analysis and people can focus on the more qualitative aspects -- like trying to understand the personal issues behind the story," Automated Insights CEO Robbie Allen told CNNMoney. More time for 'real' journalism: At the AP, reporters who would normally be stuck combing through boring company earnings reports have been able to work on investigative stories instead. Ferrara said automation has freed up the equivalent of three full-time staff positions and saved the company from having to pay overtime. It's allowed journalists "to do the jobs they got into school and this business to do," Ferrara said. One AP staff writer told CNNMoney that journalists there are generally positive about the use of automation because it's freed them up to do other stories. There's still some threat: Still, Amy Webb, a digital media futurist, recently listed journalism as one of eight career fields that will be disrupted by robots. "I don't think we are about to see an entire newspaper or website written by bots, but a lot of that first-level work doesn't have to be done by a person anymore," said Webb, a former journalist who later founded Webbmedia, told CNNMoney. "If you are just doing transcription-type journalism, yes, those jobs are threatened," he said. Webb believes the advent of automation will also "reinvent" the role of editors. After all, someone needs to fact check the robots. To that point, the AP recently hired an automation editor, who Ferrara said is in charge of figuring out "what the hell else we can automate to get things off the backs of reporters." Not your father's journalists: Webb believes the next big thing will be stories that are literally created for each individual reader. A technology known as algorithmic distribution uses predictive analysis to determine the way stories are delivered to readers based on personal preferences. All of this means tomorrow's journalists will need different skillsets, ones more focused on applied mathematics and a deeper understanding of statistics, Webb said. So should (human) journalists be concerned? "The fact that the business model doesn't work the way it did 100 years ago is definitely something to be worried about. Technology is not something to be worried about," Webb said.